This article demonstrates what items can be added to RadStatusStrip either at design time or at run time. Click on the Type here label and edit directly. When you're done, click Enter to save your changes. Click Esc to abandon the changes. Click the down arrow in the Type here label and select the desired element to add. 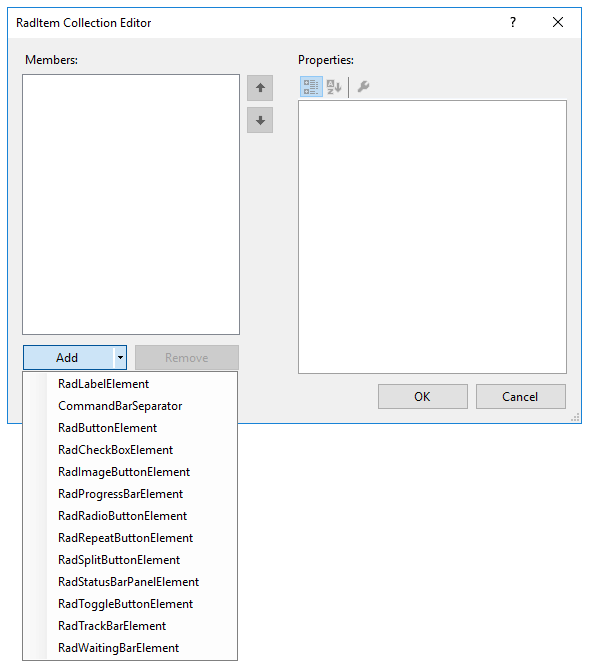 From the Properties Editor select the Items property ellipses to open the RadItem Collection Editor. Add items at run time by creating RadElement instances and adding them to the RadStatusStrip.Items collection. 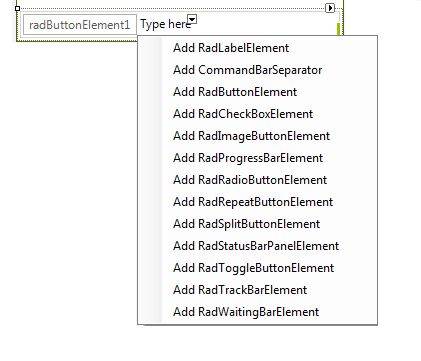 The example below demonstrates creating and adding RadLabelElement, RadButtonElement, RadRepeatButtonElement, RadToolBarSeparatorElement and RadProgressBarElement. repeatButtonElement.Text = "My Repeat button"
progressBarElement.Text = "My Progress Bar"